In 2011, the United Nations designated June 15 as World Elder Abuse Awareness Day, recognizing Elder Abuse as a “global social issue which affects the health and human rights of millions of older persons around the world.” The World Health Organization defines Elder Abuse as any act or lack of action that occurs within a relationship where there is an expectation of trust. This can come in the form of financial, emotional, physical or sexual mistreatment. Here at Elder Law & Advocacy, we serve over 8,000 seniors annually in both San Diego and Imperial counties. If you have concerns regarding Elder Abuse for yourself or a loved one, please contact our office at (858) 565-1392 and visit our website at seniorlaw-sd.org. We can help with legal services for persons ages 60 and over and their caregivers. We also assist with health insurance issues, and legal assistance for skilled nursing home residents. For physical, sexual, and emergency situations, we also suggest that you call Adult Protective Services at (800) 510-2020 (within San Diego County) or (800) 339-4661 (outside the County). WARNING-SOLAR ENERGY INSTALLATIONS CAN ‘BURN’ YOU! You “went solar” or got a new water heater or put in artificial turf or installed new energy efficient windows but now you have a much bigger property tax bill. You receive a visit from someone who offers to help you lower your energy or water bills. You may be told it will also help the environment. You are told that it is a “government–sponsored program”. That person implies it is free, especially for seniors. You had that energy upgrade installed but the product was substandard, the installation was sloppy, they damaged your property during the installation. You get behind on your property bill and may be at risk of foreclosure! WHAT TO DO: Take your time before you sign! Elder Law & Advocacy will review any documents with you for free, before you sign up or after you have had an installation completed. Ayuda! Mi dentista dice que necesito trabajo dental valorado en miles de dólares y el trabajo no es cubierto por mi aseguranza! Cuando gastos inesperados ocurren y el/la paciente simplemente no tiene el dinero suficiente para pagar por ellos, un proveedor de cuidado de salud le pudiera sugerir una tarjeta de crédito especial para ese tipo de gastos. Un consumidor angustiado pudiera considerar este tipo de opción a crédito, cual es ofrecida a los pacientes en la oficina del proveedor. Estas tarjetas de crédito médicas cubrirán parte del gasto, pero no vienen sin ningún riesgo. Estas tarjetas ofrecen no tener intereses por el término inicial. Al finalizar el término inicial, el usuario de la tarjeta debió de haber pagado el balance en completo. Si el prestatario no ha pagado el balance completo al acabarse el termino inicial, todo el interés junto con la deuda restante se convierten a deuda y estas tarjetas especiales incluyen un interés muy alto de alrededor de 26.99% reportado por el Consumer Financial Protection Bureau. En Diciembre 2013, el Consumer Financial Protection Bureau ordeno a GE Capital Retail Bank y sus subsidiario, CareCredit, a reembolsarle millones a consumidores quienes fueron víctimas de tácticas engañosas debido a inscripciones a tarjetas de crédito. En las oficinas de doctores y dentistas de todo el país, pacientes fueron inscritos para obtener tarjetas de CareCredit al pensar que eran ofertas sin interés, pero en realidad fueron acumulando interés cual “iniciara” si el balance restante no fuese pagado al final del periodo promocional. El interés se calcula desde la fecha que el prestatario se inscribió para obtener crédito. ¿Que debe de hacer un consumidor quien enfrenta este tipo de gasto? Si su proveedor medico sugiere que use una tarjeta de crédito médica como una opción de pago, no confíe en su explicación de los términos de crédito. Pida una copia en escrito de la aplicación y léala cuidadosamente. Este seguro/a de entender los términos y los cargos de interés después del término promocional. Si usted decide en aplicar, asegúrese de dividir y hacer sus pagos adecuadamente para asegurar que no quede balance restando al final del término inicial. Considere si tiene otra opción disponible como una cuenta de crédito existente con un cargo de interés menor. Si tiene preguntas sobre este o algún otro asunto legal, llame a ELDER LAW & ADVOCACY al (858) 565-1392. La mayor cantidad de adultos mayores y cuidadores/ayudantes califican para asesoría legal gratuita. Help! My dentist says I need thousands of dollars’ worth of dental work and it’s not covered by my insurance! When unexpected expenses come up and a patient just doesn’t have the money to pay for it, a healthcare provider may suggest a special credit card for these expenses. A distressed consumer may turn to this type of credit option, which is offered to a patient at the provider’s office. These health-care credit cards will cover part or all of the expense, but they are not without risk. These cards can offer “no interest” for the initial term. At the end of the initial term, the card user must have paid the balance off in full. If the borrower has not paid the entire balance off in full by the end of that initial term, all of the interest along with the unpaid balance becomes due and these special cards can have a very high interest rate-a rate of 26.99% has been reported by the Consumer Financial Protection Bureau. In December 2013, the Consumer Financial Protection Bureau ordered GE Capital Retail Bank and its subsidiary, CareCredit, to refund millions to consumers who were victims of deceptive credit card enrollment tactics. At doctor’s and dentist’s offices around the country, patients were signed up for CareCredit cards they thought were interest free , but were actually accruing interest that “kicked in” if the balance was not paid at the end of the promotional period. The interest is calculated all the way back to the date the borrower signed up for the credit. So what is a consumer who is facing this type of expense to do? If your medical provider suggests using a special health-care credit card as an option for payment, don’t rely on their explanation of the terms of the credit. Ask for a printed copy of the application and read it carefully. Be sure you understand the terms and the interest rate after the promotional period. If you decide to apply, make sure to divide up and make your payments evenly to ensure that you have no balance by the end of the initial term. Consider whether you have other options such as an existing credit account with a lower interest rate. If you have questions about this or other legal matters, call ELDER LAW & ADVOCACY at (858) 565-1392. Most seniors and their caregivers are eligible for free legal advice. So How Did You End Up With a Huge Property Tax Bill After You “Went Solar”? The Problem: You are surprised with an incredibly high property tax bill which will continue for the next 20 years. How did it happen? You decided to save on your electric bill and help the environment at the same time. You received a visit from someone who offered to help you lower your electric bill through a free government sponsored program, the PACE (Property Assessed Clean Energy) program. Or you were told the project would cost you some up-front costs, but you would actually make so much electricity, you could sell it back to the utility-you would make money! Who would turn down such a great offer? Not many folks would. But here’s the catch-the program may have some government aspects, but it isn’t free. There are other problems as well. A senior may end up with poor workmanship on the installation or they may have been pressured into more costly upgrades: a new water heater or heating and air conditioning system, artificial turf, new windows or any number of other products. The PACE program was created in 2008 through legislation to encourage energy efficient upgrades and permit financing for those upgrades by adding the costs to a homeowner’s property tax bill. Elderly consumers have contacted us with reports of home improvement contractors using telemarketing and door-to-door sales to misleadingly negotiate the terms of PACE loans. The contractors reportedly entered elderly consumers into PACE loans without the elderly consumers’ knowledge and without providing documentation, and also without advising the consumers that an increased tax assessment will be placed on their homes. We have received complaints that elderly individuals with dementia, or who were on medication, were entered into electronic PACE loan contracts they never saw, on terms they did not understand. Several have reported that “sales” were made on cell phones or tablets-they never saw or signed a document. Some individuals were not provided any documentation until well after they were entered into a tax assessment agreement. We are concerned that these same individuals will eventually be at risk of foreclosure, terrible at any age but especially egregious for an older individual with minimal resources. Take your time before you sign. Ask for and read any documentation relating to an energy upgrade. Make sure you ask for a printed copy and don’t sign anything that seems too complex or confusing. Elder Law & Advocacy will review documents with you at no charge. We are a free legal services organization with a mission to help seniors who are age 60 and over. The selected Fellowship candidate will assist clinic participants with both landlord/tenant matters and elder abuse restraining orders under the direct supervision of the clinic’s lead attorney. Applicants must be either an incoming 2L or 3L, or recent law school graduate. Please submit the following documents electronically in a single PDF file in the order indicated below to creilly@seniorlaw-sd.org . Please title the email “(Your Name) –Fellowship Application”. 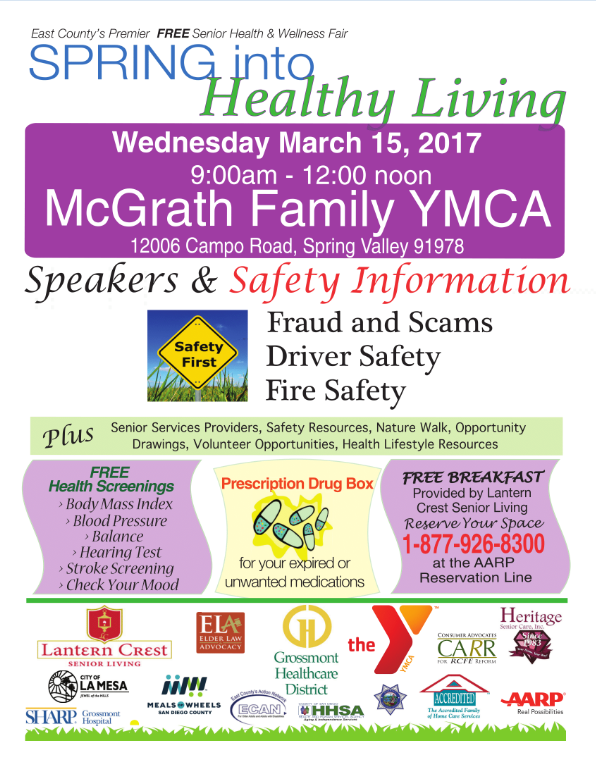 Join EL&A at the East County Spring Into Healthy Living Fair on March 15th!